In a garlic & herb dressing. Source of fibre. 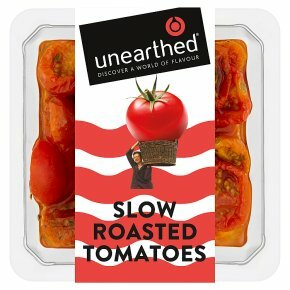 Suitable for vegetarians.Some strange alchemy occurs when the humble cherry tomato is roasted low and slow. The flavours deepen and intensify in a way that seems to enhance pretty much any accompaniment. We discovered these particular tomatoes in Turkey and Chile, where the producers simply halve them and let the oven do the rest. When you taste the result you'll admire their restraint.